This V-Day, express your love with a riot of colors! Download our free printable coloring cards for Valentine’s Day, print and fill it in with the colors of your heart’s choice. The day of love is soon approaching and you’ve probably started thinking about what to give your special Valentine! Of course, it has to be something special, and something that shows exactly how YOU feel. And something handmade checks all the right boxes for this! Whether it’s a card or a gift, it’s exactly what will trigger the ‘Awwws’! There are a lot of handmade options you can try, from photo holders to desserts to custom gift boxes. 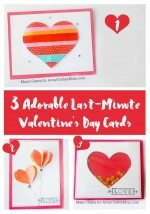 But if you’re out of time or want an easier option, a handmade card is the way to go! 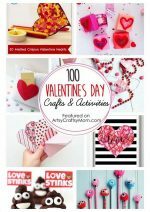 Here are four coloring cards for Valentine’s Day – absolutely free! They’re available in two versions as well – US English (You COLOR me Happy) and UK English (You COLOUR me Happy). With so many options, you’re all set! 1. First, you need to download the printable. Choose the US or UK versions to print. You’ll find that there are four mini cards in the printable. Cut out each mini card separately. 2. It’s time to make the card. 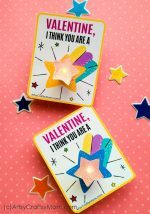 Cut out pink paper that is a little larger than the mini card. Fold a Red Letter / A4 size paper in half along its long edge. Then fold in half again. Open and cut along the center to make a vertical card that’s larger than the pink paper. 3. Assemble the card by sticking the pink paper in the middle of the red card and the mini card in the middle of the pink paper. So now you have a coloring card with a pink inner border and a red outer border. Do the same with the other mini cards. 4. Okay, time to decorate! Take your silver gel pen and draw little silver hearts along the borders. You can also make polka dots if you want. 5. You could leave the card as it is, or take it a notch higher by adding a small gift – Mini Marker pens, Stackable Crayons or mini watercolor packs. 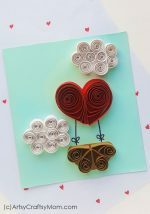 Use washi tape to attach the gift to the card. That’s it – your free printable coloring cards for Valentine’s Day are ready! And you got four cards with one printout! There are so many things you can do with these cards. Color them in yourself or let the recipient color them in with the markers you’ve attached. You can also use them as gift cards for your special Valentine’s gift or include them in your Valentine decorations. You can also insert them in this Valentine Ferris Wheel! 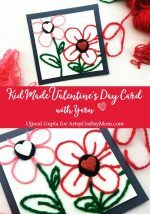 If you want more handmade Valentine’s Day card ideas, don’t forget to check out our Yarn Valentine Card, Tic Tac Toe Valentine Card, Melted Crayon Valentine Card or these last minute Valentine Card ideas! I love these, but I cannot figure out where to click to download them. Can you help me out? These look great but I cant see a link to download them. Sorry! I have added the link now. Please download.